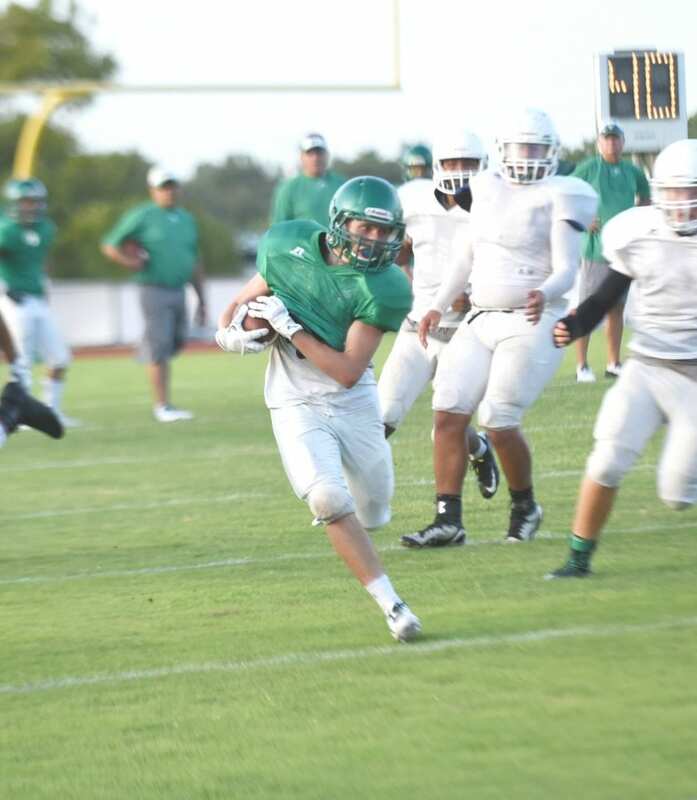 CHRIS FILOTEO|PLEASANTON EXPRESS Pleasantons Santiago Arguijo sprints to the sideline in a scrimmage against San Antonio Kennedy last week. The Eagles travel to face San Antonio Edison Friday night to kick off their season at 7a:30 p.m. The Eagles vastly improved from last week after their final scrimmage against San Antonio Kennedy at home. I thought we took big steps forward from the first scrimmage, Eagle head coach Tab Dumont said. Pleasanton worked out its kinks on the gridiron as it prepares for the season opener Friday night. We improved on fundamentals the most last week, Dumont said. With two scrimmages under their belts, the Eagles gear up for the season opener Friday night against San Antonio Edison at Alamo Stadium. The kids and I are excited about playing there, Dumont said. Last year, Pleasanton defeated Edison 28-10 on the road. Kick off is set for 7:30 p.m. Friday night at the Rock Pile.